Develop valuable relationships with your peers in the industry that you can leverage throughout your career. Learn how to effectively collaborate, get your voice heard, make sound decisions that propel you and your team forward. Gain expertise in understanding what it takes to be a channel expert and how to bet position and develop yourself for success. Register today for the September 13th, 1pm PST / 4pm EST session! 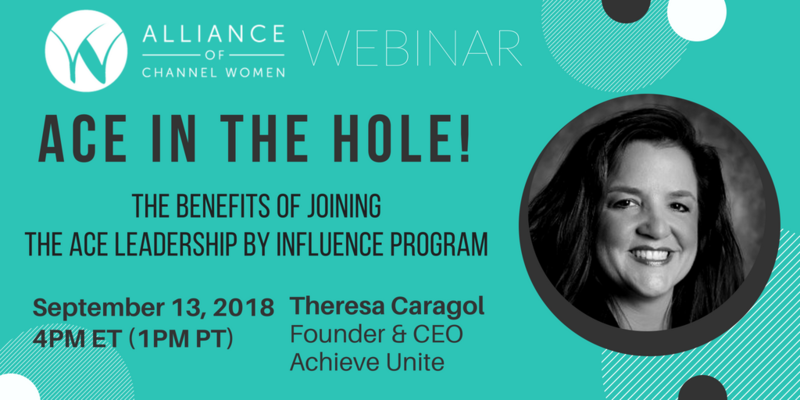 Theresa is an accomplished channel chief, consultant, speaker and author with over 20 years’ experience building and managing multi-million-dollar indirect channel teams and strategic alliance programs from inception to sales success. Prior to founding Achieve Unite, Theresa held senior executive Channel Chief roles at Extreme Networks, Ciena and Nortel. Theresa has received numerous IT industry channel accolades for her work including: 2014 CRN Top 50 Most Influential Channel Chiefs, 2013 CRN Top 10 Next Generation Channel Leaders, 2015 Golden Bridge Gold Award for Best Program Leader.